"Whatever a bug can do, this Bugg can do Better!" 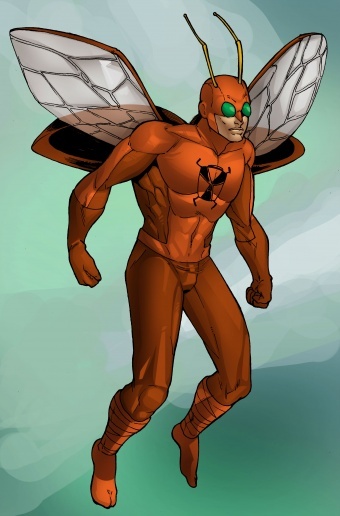 Jimmy "James" Tyler is one of the the few heroes with insect powers and abilities alongside the many heroes that reside in Millennium City. Jimmy lives with his 45-year old widowed grandmother and does his best to make sure shes safe and sound he would literally pummel anyone who dared talk down about her or hurt her. Jimmy gained his powers through a run-in with a Qularr Firebug during the Qularr Invasion it would be months after Jimmy would show signs of death but he would soon recover to find out that he was left with the powers to crawl on walls, fly, control fire, and have retractable claws. 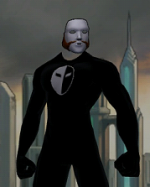 His first act of heroism would be when a member of DEMON would attack his school for unknown circumstances Jimmy would soon save himself and every student on that day, when his actions were soon printed in the local paper the very next day Jimmy then saw he could make difference; he saw could protect the citizens who were preyed upon by the forces of evil. Thats when he finally became the vigilante known as, Bugg. 11 Bugg: A Blast From the Past! Jimmy "James" Tyler was born in Detroit, Michigan as an anti-social outcast who was often treated like a bug always getting stepped on. In high school he had troubles with getting dates, making friends, and being extremely gullible. After school Jimmy would always go home in City Center where he lives with his 45-year old grandma, Alicia James. She was getting up in age and Jimmy always made sure he was there to look out for her; he thought him and his grandmas as both "widows" since Alicia's husband died of lung cancer and Jimmy's dad never seen him a day he was born. So the only woman he had in his life was his grandma. As James Tyler: James stands a height of 5 feet 5 inches. He wears his hair in a sloppy, unkempt design and he can often be spotted wearing his favorite short-sleeve green dress shirt with a white long-sleeve thermal underneath. 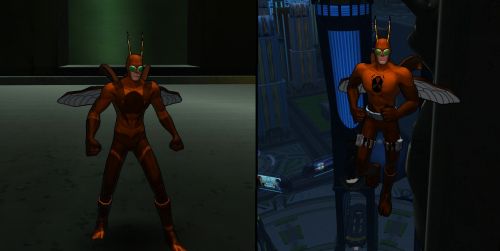 As Bugg: When James is spotted as Bugg he is an inch higher standing at 5 feet 6 inches and is wearing his notable brown and orange costume with long 3 inch antennas spouting from the top of his mask with green two-way mirror eye lenses. Bugg as an empowered superhuman is very confident and cocky about the things hes capable of and can be very immature at times. 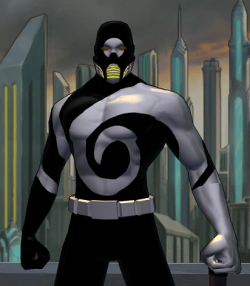 He is both sarcastic and a wise-cracking superhero with a knack to always piss of opponents in hopes of them messing up and cause themselves to do the dumbest things, but his smart-mouth can be a bit harsh and actually cause himself to let his guard down and make him vulnerable to surprise attacks. When Bugg is in his civilian identity of James Tyler he acts often shy and sometimes a little sarcastic to further separate his personality as Bugg and keep people from making the assumption that James is actually Bugg (primarily due to a spike of YouTube showcasing Bugg and how jokey and smart-mouthed he is). The media is always talking about seeing aliens, crop circles, and "little green men" everywhere, but this alien was NO joke! One day the nice sunny afternoon went from light to dark and it started raining fire. Alien spaceships then started popping up all over the city and landing in the surrounding neighborhoods, The Champions reported it was the alien race, The Qularr and they were looking for something having "scavengers" search nearby buildings and streets. Jimmy happened to be walking home from school when this was all going down, a force field went up trapping the Qularr in one place but sadly civilians were trapped inside the field with the Qularr. Jimmy didn't know what to do but hide so he ducked into a nearby alley. Jimmy ducked inside they alley and hid behind a dumpster hoping that he would be safe from the invading aliens. Jimmy was so scared that apparently he didn't feel a "Firebug" land on the back of his neck its giant needle-like horn and jabbed it inside Jimmy's neck injecting him with a poison that caused him to pass out. Jimmy's unconscious body was retrieved by the Logistical Emergency Assistance Foundation (LEAF) and was taken to one of their makeshift clinics where he quickly recovered and got well again. Jimmy was transported back home to his Aunt Alicia and they were told to stay indoors until this invasion is over. After a whole 24 hours The Champions made a public service announcement saying that the Qularr are retreating and Earth is safe. Everyone cheered so loud it could be heard from outside everyone except Jimmy whose neck started to feel like it was set on fire. Week after week Jimmy has experienced 8 blackouts, horrific neck pains, achy bones, and massive sweating. Jimmy doesn't know whats wrong with him it feels like right after being bit by that Firebug caused Jimmy to feel like he was hit by a bus. He thinks he should see The Champions or some voodoo doctor because he surely knows this isn't normal, but finally after three months Jimmy recovers and starts to feel a lot better so much better that he decides to go for a run something Jimmy never does. He notices that he possessed the speed and agility of an Olympic athlete and was able to run and jump like a parkour runner when Jimmy was almost hit by a Narcola truck his quickly jumped out of the way where he noticed he was sticking to a wall like an insect. He took one hand off the wall and looked down at it where he saw spike-like claws that acted like suction cups, Jimmy losted focus and fell off the wall this was where he generated retractable wings and begun to fly. Flying through the city like a human helicopter Jimmy put the facts together and realized by being bitten by the Firebug gave him the powers of a Qularr alien. After weeks of power preparation Jimmy went to Carl's Gym where he learned basic hand-to-hand combat he started going there everyday after school and told his grandma that he was at the library. Jimmy also putting together a bug-themed suit as well just as a way to sign up for luchador wrestling, this was quickly scraped when a demon calling himself, Morbane was attacking his school in Westside. Jimmy noticed he finally had a chance to use his new powers in action throwing on his costume Jimmy attacked Morbane trying to get him away from the students, grabbing his leg Morbane throws Jimmy out one of the windows in his school and Jimmy ends up in a warehouse where hes nearly beaten to a pulp but later defeats Morbane by using a live electrical cord to weaken him. Morbane escapes and the police later show up at Westside and the warehouse he was at. 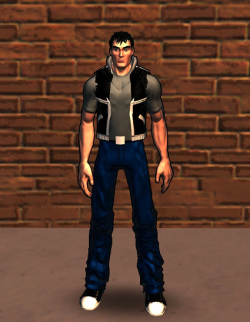 Jimmy gets back to the school in time to change clothes and get back in his civilian identity. Jimmy quickly recovered from his wounds and picked up a newspaper Saturday morning only to find that HE was in the paper saying that "an unknown vigilante with a bug-like appearance saved the students of Westside High' Jimmy later thought that maybe he was destined to be a hero, maybe there was a reason why that firebug bit him.. So Jimmy knew he was destined for greatness and he knew that maybe he can make a change in the world as this new "bug" hero so he later goes in his room and digs out his mask from his bookbag glaring into the lenses saying "a bug hero, eh?" Jimmy then puts on his costume and flies out his bedroom window screaming "I AM BUGG!!" 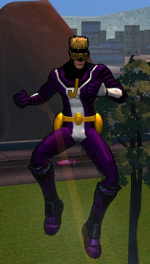 James Tyler A.K.A Bugg, has been through a lot in his new career as a costumed crime-fighter and has been coming up with a lot of poor excuses for why he seems to disappear when a fight between Bugg and another super-powered foe unfolds. James has decided to become a journalist for his school, James knew that even though a school journalist usually prints articles about school-related topics like sports, clubs, etc. but recently James' school at Westside High has promoted that the kids may print articles relating to superhuman activity as long as they remain monitored by law-enforcement of any kind, that was James thought that being a journalist can make a perfect cover-up for his strange disappearances. James and the rest of students have thought of the winged avenger known as, Bugg as the school's hero and protector and luck James he seemed to be a perfect fit for reporting any of his actions with superhumans due to him being always being a "Bugboy". 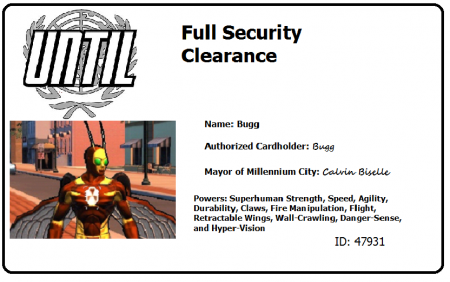 James immediately accepted the position being that it would easy for him to report Bugg's latest activities in Millennium City (being that James is actually the masked insect, Bugg). That was when James became a school journalist, reporting super-powered activities in Millennium City especially those caused/or prevented by Bugg. About a year ago when James first debuted as Bugg, during the months that followed he was hunted down by an assassin named, Rachel Carpenter who was contracted to receive his DNA, what she didn't know was after her preparation for his DNA to be made into a serum that would then transform her into future supervillain, Swarm Queen. His DNA was used to create clones of the hero, this would then kickstart the event known as, the Clone Legacy. Stuck in a boring history class during 6th period, James is coping down notes until a explosion is heard down the street from where his school is located. School is dismissed early allowing James to retreat to the roof of the school by wall-crawling and in a instant James would transform into Bugg and fly off to investigate what exactly is going on. When Bugg first arrives at the crime scene the police have already showed up and someone called himself Assassin Bugg has kidnapped hostages and held them captive in a warehouse not far from the crime scene, Bugg is soon no longer Westside's Finest Hero after Assassin Bugg claims hes in "cohoots" with Bugg and that Bugg is no hero. Despite his public hatred and the police's supposed need to arrest him Bugg flies off to save the hostages and stop Assassin Bugg. Bugg soon save all the hostages but is yet to stop Assassin Bugg, who performs a surprise attack which to Bugg's own surprise didn't set off his Bugg-Sense but he still goes toe-to-toe with this "ripoff" version of him but somehow Assassin is faster then him and thus is able to knock Bugg out cold and takes him back to a labortory somewhere outside Millennium City. 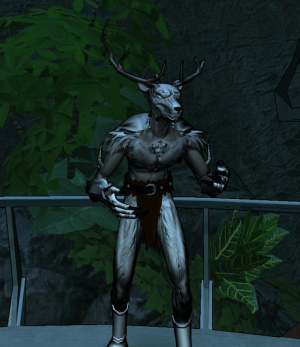 Bugg reawakens in a tube and it is there he meets a strange man-thing that goes by the name of, Wendigo. Wendigo apparently is the person who hired Rachel Carpenter now known as, Swarm Queen to receive Bugg's DNA which he would work into the serum which gave Swarm Queen her powers. Wendigo was left with just enough serum to make only one clone, Assassin Bugg but he wasn't a "true" clone and for that suffered from cellular disintergration so Wendigo provided Assassin Bugg a suit that would keep his cells in check and stop him from collapsing into dust, but the main reason Wendigo wanted to kidnap Bugg was so that he can get some more of his DNA so he can mke some more serum to create the rest of the "Bugg Family". Bugg's DNA was later harvested and use to create the rest of Wendigo's Bugg Family. Now that Wendigo had no more use for Bugg he decided to try and kill him, which failed epically since Bugg manage to escape the tube he was trapped in and left Wendigo for the police. Bugg later went out to stop the clones from whatever they planned on doing with their new "births" into the world. On the way to stop his clones Bugg managed to learn that these guys were clones of himself and so his Bugg-Sense won't detect them as threats since their technically him but evil and stuff. 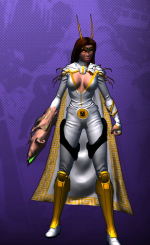 The first clone was Jamie Tylerson a.k.a Insect Girl who apparently was robbing a bank and James managed to defeat rather quickly and learned she was the "youngest" of the clones so some her powers weren't as strong as the other clone's, so she couldn't fly as fast as the others or lift as much as the other clones. She later made ammends with Bugg and decided to help him on his trek to stop his clones. 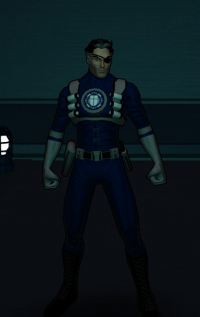 Ken, oddly enough was probably the most easiest and most successful clone of Bugg since he, unlike the others, wasn't rampaging through the city but in fact was sitting a library and reading a book on Steven Hawking and he knew why Bugg was here and openly joined the three on their venture to stop the last clone, Jackson Tyler the Assassin Bugg. Jackson was the most screwed up one and his degeneration was making him crazier and crazier by the minute and planned on blowing up Champions Headquarters which is located in the heart of Millennium City and it was up to The Buggs to stop him, but this made fellow Wolfe more afraid of what would happen to him Jackson's degeneration made him crazy and now Wolfe's afraid of the same fate but Insect Girl, the younger sister of the Buggs speaks up saying they didn't choose to be in this world, but since they have powers they need to realize that power isn't and never will be a gift to those who retrieve them but a responsibility to use them for the greater good and for that they must stop Jackson before he gets himself or many other innocent people killed. Bugg then retrieves his Sky Buggy and then prepares to open fire on Jackson which knocks him off the rooftop he was perched on aiming a rocket launcher on Champions HQ, Bugg soon parks his Sky Buggy and him and the other Buggs goes to check on Jackson who claims its took late and had already perched bombs and other explosives to Champions HQ before they even showed up and he then pulls out a 9mm handgun blows his own head off in front of his brothers and sister. Bugg then says that only he can stop the explosives, the other Buggs would as why but Bugg will reply with Jackson and I shared a weird psychic link and he told me only I show go and stop the bombs. Bugg would disbatch the fellow explosives except for one which would horribly damage Bugg's wings and put him out of commission leaving Ken Richardson to take up the Bugg mantle while he heals. 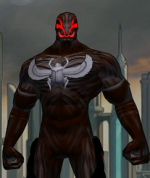 Wendigo, creator of the Bugg "Family"
James Tyler also known as Bugg just recently stopped a man-creature named, Wendigo who used a stolen blood sample from Bugg to create 4 clones of the insectile hero of justice. Just recently Bugg stopped one clone named, Jackson Tyler also known as Assassin Bugg from blowing Champions HQ but in the process was horribly injured in one explosion that happened to terribly damage Bugg's iconic wings as well as lodge some shrapnel in his back. This left Bugg to pass on his mantle to Ken Richardson, the true successful clone who seems like a responsible replacement while he heals. Ken Richardson is honored but confused by the fact that despite JUST meeting his clones Bugg already feels that his is worthy to take up the antennae and cowl and become Bugg, but it was because James "sensed" innocence and goodness in Ken's heart and further motivates Ken to take up the mantle while James heals and his wings grow back fully repaired and the shrapnel is removed from his back. Ken later agrees to taking up James' offer, but decides his costume is a "fashion disaster" with the whole way he made the suit look but enjoys the color scheme so he was gonna "tweak" it while James' was out of commission. Ken sets up a small little workstation for his self in a warehouse where he mods the Bugg suit to his liking and then once its done, he starts his career as Bugg. Ken would be Bugg for 2 and a half months being that the shrapnel in James' back was deeper then expected and his healing factor was far too damaged itself to even heal the wounds, even once the shrapnel was removed. Ken would gain a newfound publicity as Bugg with the media saying this "new" Bugg was far better then the original, being able to stop eight crimes in one whole day in about 4 hours. Ken was actually a better Bugg and far more superior, but James didn't mind as much as long as Ken is making the Bugg title become a more household name and not using the opportunity as a chance to ruin his career. Eventually Ken's fame as Bugg would actually get the best of him and he would get captured by Swarm Queen and she wishes to kill Bugg for getting her boss arrested and she even manages to temporarily depower Ken so she can ensure he doesn't get away, but the cowl on Ken's Buggsuit was outfitted with a comm unit so that he can keep in touch with James in case of an emergency and this certainly was one, he signaled James to come help and James did. At this time James' wings still weren't fully regenerated but his back had at least stop hurting so he threw on a spare Bugg costume and located Swarm Queen's hideout in Millennium City using the Bugbots to pinpoint her exact location cooridnates which she was clumsy enough to not leave hidden. James, the original Bugg would eventually break in and take down all of Swarm Queen's mind controlled Qularr drones and managed to free his clone brother so he could fight alongside him. Also in the battle Swarm Queen would attempted to make a quick getaway by transforming into a swarm of flies but finally after waiting for several months, James' wings would finally fully heal and he could fly again to chase after Swarm Queen who he and Ken would stop together and prepare to turn her over to the police only for her to make another escape, vowing revenge like always. Ken would later thank James for saving him and saying he take his mantle back, while it was fun he has too many people aiming a target on his back and he doens't think he can take that kinda heat just yet since hes just a "newborn" and so Ken dons his old costume re-becomes Brown Bugg while James becomes regular ol' Bugg again and thus ends a perfect saga for a perfect adventure. Bugg has made his mark in the world by getting tiny articles and pictures in recent issues of SuperWorld! magazine and in the Westside High school newspaper. 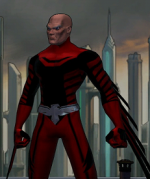 James Tyler A.K.A Bugg overheard many students and friends say its time for Bugg to change his costume saying his old one looks: "ugly" James refused to let these comments get to him and continued to wear the old outdated suit his first appeared in. James one day heard a ARGENT roaming the parking lot of Dynamic Labs stealing weapons and equipment, suiting up James now Bugg springs into action and fends off the ARGENT agents. Bugg is outnumbered and outgunned but refuses to be defeated and uses his insectile powers and fire manipulation to defeat all the ARGENT agents however a Cyborg corners Bugg and ambushes him with gunfire and explosives which completely obliterates Bugg's costume, he manages to deactivate the Cyborg and flee the scene before the cops come and realizes that he really is gonna need a new suit. Tired of constantly restoring the suit's armored features James tosses the old Bugg suit for an orange and brown all-cloth/fabric uniform sewn by James himself. He later submits an article into the Westside High Tattler newspaper club with the headline reading: "Bugg: New and Improved. 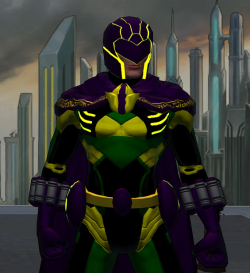 The Winged Avenger's New Look". James gets an "A" for his studious article and story and has everyone in school fall in love with the new suit he now wears. Bugg: A Blast From the Past! On a warm Saturday afternoon, James Tyler a.k.a Bugg is enjoying a usual fly around Millennium City as The Insectile Bugg and so far everything seems to be going great; no homework, no school, no problems or crimes to stop, just a relaxing fly through Millennium City. Elsewhere in the year 2026, an adult version, 26 year old version of Bugg has beaten his nemesis, Halloween yet again and prepares to turn him in to the police so he can be put back under lock and key, but Halloween has grown tired of constantly losing to Bugg many times and now plans to stop this once and for all by traveling back in time to Bugg's teenage years and plans on killing him prior to him even getting his insect powers and within a matter of seconds a giant flash goes off and Halloween disappears. Halloween lands in the year 2014, but realizes that the stolen time traveling device he stole from the crazed mechanic, Juryrig sent him back in time but sent him back to when James had already acquired his powers and became Bugg, but it no longer matters as long as Bugg is erased from today's timeline he will cease to exist in the future. Back in 2026 adult Bugg gets some help from Juryrig to use his time portal to send him back to 2014 and stop Halloween from killing his younger self, its only a matter of time before Juryrig hot-wires his time portal and has it set for 2014 and ready for older Bugg to use. Later Younger Bugg is then knocked out of the sky and falls down near a construction site where he meets face-to-face with his older self and after taking a few minutes to hear the older version of him out they later team-up to stop Future Halloween while the Mad Bomber himself eyes the two's conversation from a nearby rooftop and then sets out to find the Younger Halloween and team-up with him to make it a fair fight. Future Halloween and Younger Halloween soon come to an agreement to help each other take out the Buggs and then set course for a battle royale in Downtown, Millennium City. The four Future and Current versions of the heroes and villains go toe-to-toe and wind up destroying half of downtown, nearly blowing up the mall shopping center but Future and Current Bugg eventually wind and put Current Halloween back in prison and Past Halloween back under arrest and ready to be sent back to the future along with Future Bugg, using the stolen Time Mini-Disk that Future Halloween stole Older Bugg and Halloween go back to their timeline while a suspicious being watches from the shadows as a new insectoid character's fable is unraveled from the Bugg-Verse after our strange-but-unique visitors return back home. Upon the future versions of Bugg and Halloween return back to the future, Bugg starts receiving psychic flashes of another girl around his age with the same powers as him and this "flashes" are giving Bugg annoying and painful headaches so painful that he visits Dr. Silverback and he diagnoses that Bugg's "Bugg-Sense" is auto-attuning itself with someone with a similar power set as him after performing an x-ray of Bugg's brain it was realized that it would always activate at the same time when he would receive his psychic visions. This was when Bugg learned that he can use his Bugg-Sense as a radar and pinpoint the exact location of where this other "bugg" was. He or she was being held captive by ARGENT in a special containment facility which Bugg fought through single-handedly and freed the subject known as, "Critter" whose real name was Celina Patterson and she didn't take it too kindly being locked up for over a since the Qularr Invasion. Bugg had finally realized that Dr. Silverback was right and he was able to realize she possessed Qularr powers as well and she was way faster then him and was able to keep up with him when it came to hand-to-hand fighting. Bugg eventually came to reason with Celina and revealed himself to her as James Tyler and she winds up feeling a strong attraction to him and she doesn't know why except for the fact of thanking him by planting a sloppy, wet french kiss on him. James and Celina then start dating and Celina goes over her powers and finds out her abilities are far more superior to James and she could potentially be the next Bugg if James every grows tired of the mantle. James and Celina then debut as the duo team named, Bugg and Critter and this sprung media fire across many tabloids and newspapers. Celina eventually starts attending the same school as James and reveals that she was abducted by the Qularr during the whole invasion and was experimented on to the point where she developed powers and escaped but was eventually recaptured, this time by ARGENT and put in a superhuman prison where she took more time to learn how to use her powers and remained there for about a year until James recently freed her and thanks him. This then starts a new age of justice for the two lovebirds that have now come to be known as, Bugg and Critter. "Better get your bug spray! Cause you're about to get bit!" Superhuman Strength: Jimmy's insect physiology allows him to lift up to 10 tons and throw things that are quite bigger then him with ease. Superhuman Speed: Not at fast as a speedster but Jimmy can run at a the pace of that of an Olympic track runner. Superhuman Agility: Quite rare in Qularr history, Jimmy has the agility of a cat making him quite untouchable. Superhuman Durability: Bugg's durability is probably the best thing about him. Bugg is capable of being thrown through a wall and walk it off likes its nothing. He once took a punch from the Omicron-powered Ripper and barely had his ribs broken as well as walked it off with only a minor bruise which healed in about 24 hours. Superhuman Stamina: As a side-effect of the Firebug venom, Bugg can physically exert himself for a full 24 hours until fatigue from certain toxins and poisons begin to set in. Superhuman Flexibility: Bugg's flexibility rivals that of a gymnast's. He can achieve and pose imaginable and even squeeze through the tightest of spaces, except those that only a mouse can fit through. Superhuman Equilibrium: Bugg possesses the ability to achieve a state of perfect equilibrium in any position imaginable. He seems able to adjust his position by instinct, which enables him to balance himself on virtually any object, no matter how small or narrow. He has developed a unique fighting style that made full use of his agility, strength, and equilibrium. Superhuman Reflexes: Bugg's reflexes are similarly enhanced and are currently about 20 times greater than those of an ordinary human. He can often dodge most attacks at an instinct with and without his Bugg-Sense and he can become quite untouchable in combination with his speed and agility, if Bugg were to be knocked out his durability factor would offer him some great protection from heavy explosions and impacts. Bugg's reflexes are often in the forms of flips, somersaults, and back-flips as well as often landing on his feet. Superhuman Leaping Ability: Much like a grasshopper, Bugg can jump at tremendous heights. This is done by Bugg using his power of Superhuman Strength to push against the ground and perform a mighty leap. Fire Generation: After being stung by the Firebug in the alley that day gave Jimmy the ability to generate and project fire. This is done by Bugg accelerating the molecules around him til they eventually combust and create a fire which Bugg can use for defensive and offensive purposes. Bugg can often bend his fire into the form and shape of things like nets, lassos, and even plasma blasts. After prolonged usage of his fire powers Bugg can become fatigued and his flames will become weaker than normal. Usually resulting in him needing to absorb heat from other existing sources if he wishes to continue onward during a fight. Heat Absorption: James' mutated DNA allows him to not only generate and control fire but absorb it as well. As Bugg, James can siphon heat from other existing sources, including people. Bugg can often use this to replenish his "energy" or "refuel" his fire after using up most of his juice. Flight: With the help of his retractable wings, Jimmy can fly at supersonic speeds. James' even proved that when hes older he could even be able to fly faster then speedsters like, The Bullet, who can also run at supersonic speed, during a race between the two heroes James' would've almost beat him if a sudden Mega-Destroyer didn't start attacking the city at the very last second. Wall-Crawling: James' exposure to the Firebug venom induced a mutagenic, cerebellum-wide alteration of his engrams resulting in the ability to mentally control the flux of inter-atomic attraction (electrostatic force) between molecular boundary layers. With this James is fully capable of making almost any part of his body adhere to any surface (mainly his hands and feet). James can stick to any surface using either his hands, feet, or back and he can also render his mask irremovable by making it stick to his face. Regenerative Healing Factor: Jimmy's new powers allow him to heal at a super fast rate, he can heal from bullet wounds in under 2 seconds. After getting his powers, he soon found that his eyesight was repaired, discarding his glasses. He has difficulty regenerating from plasma and particle-based damage, but other than that Bugg can heal from wounds within 24 hours. Enhanced Hearing: Jimmy has expert hearing since the Qularr lack the perfect eyesight to see everything but using their advanced hearing as substitutes. Bugg's hearing is so great he can hear through solid concrete walls to hear the cry of a restrained woman as displayed on one crime patrol with Wheelman. Retractable Claws: Jimmy also possesses short, retractable claws at the tips of his fingers. The claws are also razor sharp and, coupled with his great strength, are able to rend materials as durable as cinder block. Hyper-Vision: For when his danger-sense is on the fritz. 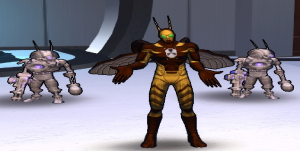 Bugg possesses a "Hyper-Vision" that allows him to slow down time (through his eyes) and quickly evade attacks. 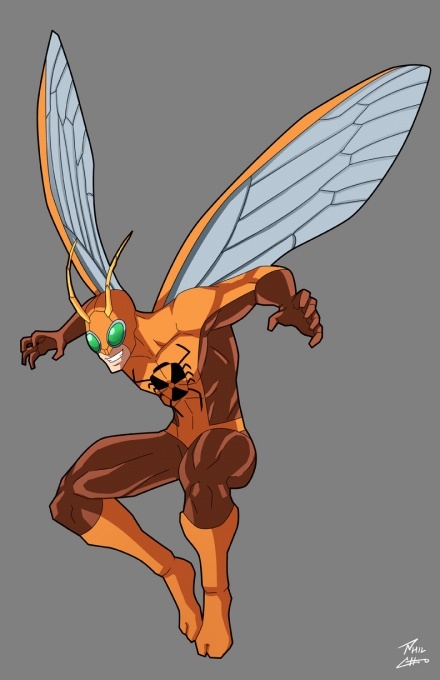 The only limitation is someone, or the attacker has to be in front of Bugg in order for this power to work, but due to Bugg's enhanced hearing he is capable of turning around quick if an attack came from behind. Bugg-Sense: Bugg possesses a danger-sense that allows him to evade danger in a matter of seconds. He can sense nearing dangers and sense unwanted or hectic threats to his well-being, this sixth-sense phenomenon has become known as the self-labeled, "Bugg-Sense". Bugg's Bugg-Sense is also very precise and can sense the direction of where the exact danger is coming from (ex. bullets speeding towards him from behind). Bugg's own body reacts accordingly to the perceived threat his Bugg-Sense is detecting and can manage to dodge the incoming attack with great acrobatic skill and prowess to impress the greatest of Olympic-level athletes and acrobats. Accelerated Metabolism: Bugg being that he is a hybrid between human and Qularr he possesses an Accelerated Metabolism that makes him immune to strange pheromones, toxins, and poisons and if not immune, at least renders him un-phased by certain toxins until fatigue begins to set it. Understanding Qularr Knowledge and Language: Seeing how Bugg is half Qularr now he can understand all Qularr knowledge such as their weaponry and understand and speak their fellow language. 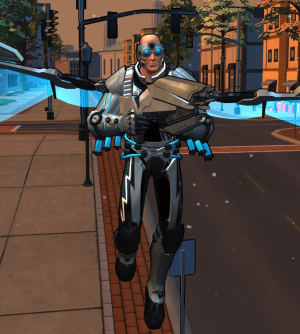 Symbiotic Exoskeleton: Jimmy also has a retractable exoskeleton which enables him to be invulnerable against bullets and lasers, but not completely invulnerable. Recently lost this power due to low blood sugar making it incapable of ever creating the exoskeleton again. "What can I say? I'm a FLY guy *chuckle* Get it? No? Screw it then." Genius-level Intellect: James is very smart for being only a teenager. 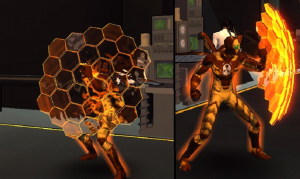 As Bugg, James has created the "Bugbots" accidentally by just playing around with some components he found in his grandma's basement and he has also enhanced the effects of the Hex-Shield by also making it extremely resilient against missiles and energy blasts. 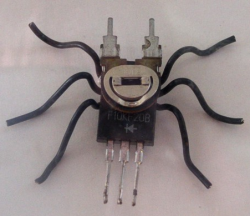 Bugg also built Electronic Micro-Bugs capable of dropping in on phone and physical conversations with others as well as offer as the perfect spy cam and Bugg has also built an HUD into his mask lenses so the Bugbots can process and send information from the Micro-Bugs to Bugg himself. Skilled Inventor: James has shown much intrigue and skill when it came to gadgets and "doo-dads". Back when he was 15 he made the Bugbots A.I with no problem and this was just by using junk parts in his grandma's basement and recently made special Electronic Audio/Visual Bugs using several microchips from his old laptop. Form of the Insect: Bugg has developed a unique fighting by combining his superhuman strength, agility, equilibrium to best his opponents in hand-to-hand combat. He has bested Shinryoku, Master of the Burning Chi technique by using his unique fighting style thus thanks to the intelligent mind of Shinryoku he named it, Form of the Insect. Skilled Acrobat: Thanks to his great strength and phenomenal equilibrium, James is an excellent athlete, excelling in all gymnastic fields and being able to perform every acrobatic stunt ever performed, including others that can never be performed by even an Olympic acrobat. Experienced Hand-to-Hand Combatant: Due to his training with Shinryoku and his fighting skills slowly advancing as the years pass, Bugg has become an experienced hand-to-hand combatant by often blending his quick speed, agility, and reflexes and incorporating them into his "Form of the Insect" martial art as well as throwing in a few flips and kicks Bugg is almost an untouchable sparring partner due to that his relies on quick wit, speed, and reflexes to try and gain the upper hand in most brawls with other opponents. 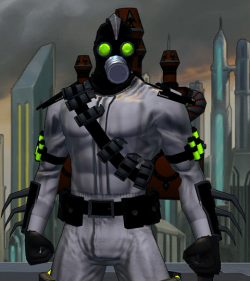 Qularr-Cide: Thanks to Bugg's half-Qularr DNA he is vulnerable to this special chemical that is hazardous to the Qularr. No Oxygen? No Fire! : Can't have fire without oxygen! If Bugg was/is stuck in an environment that lacks any oxygen molecules for him to conduct a flame from then Bugg's main power of fire generation is rendered completely useless as this is his main source of power in a fight. Secret Identity: One of Bugg's TRUE weaknesses. Bugg now wears a half mask for reasons of how hard it was to breathe under the full one whenever he would get a good "exercise" in. Bugg still goes to extreme lengths of protecting his identity and is capable of making his mask stick to his face due to him being able to mentally control the flux of inter-atomic attraction (electrostatic force) between molecular boundary layers and thus is fully able of making his mask stick to his face using sheer willpower. Lack in Self-Confidence: Bugg maybe willing to help and protect others but secretly his true weakness is lack in self-confidence believing that he doesn't have a place in the hero world considering that most adults would say the same. Power-Dampeners: Power-Dampeners can completely/or temporarily dampen Bugg's alien DNA and leaving only the dormant human gene alive and active, rendering him powerless for the time being. 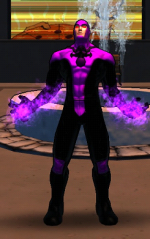 Plasma and Particle Damage: Bugg's healing factor works at tremendous rates but when he is faced with laser swords or any use of plasma/and or particle attacks, it takes Bugg awhile to heal from these attacks. When he was first sliced with a laser sword of a VIPER agent it took 15-20 minutes for Bugg to heal from the attack since it left his skin boiling and blistering from the attack. Set of Qularr Energy Pistols: Jimmy has a pair of Qularr Energy Pistols his keeps in a desk in his Grandma's basement. He rarely uses them due to vowing never carry or use a gun of any kind. Unless COMPLETELY necessary. 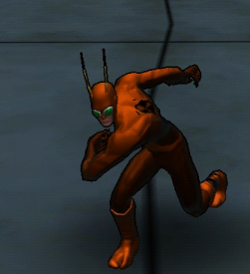 Bugg Costume: James wears an orange-and-brown colored spandex costume that covers him head to toe, excluding the mask's cowl that leaves only his mouth exposed. The costume was originally nothing more besides a standard fabric costume capable of being slashed and torn by any sorts of damage Bugg may take. 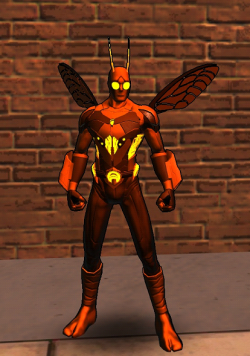 The costume was later outfitted with kevlar and strong weaving that is resistant to rips and tears as well as fire and heat-based damage due to Bugg's fire controlling abilities. The suit is also equipped with special eye lenses that protect James' eyes from the searing heat that is generating from his own fire-based powers and even protects from unwanted debris and dust particles James' may become exposed to when flying at such high distances. Bugg Antennae: The Antennae on Bugg's cowl aren't just for design purposes but they have special psychic inhibitors which block off the use of mind control and hypnosis of most psychics and mentalists, these were built shortly after Bugg's run-in with PSI which left him with massive headaches and migraines he soon healed from. Cell Phone: Mainly used to keep in touch at home or with allies of any kind. Camera: Just in case an investigation comes up Jimmy carries a miniature camera in his utility belt. Bugbots: The Bugbots are a recent addition to Bugg's arsenal. These miniture heroes may be small but carry alot of firepower. They also monitor crime after hacking into the MCPD databases and now inform Bugg of crimes in progress through an earpiece built into his mask cowl. Bugg-Flare: The "Bugg-Flare" is a specialized flare gun designed by Bugg that launches a fiery "bug emblem" into the sky. Bugg uses this mainly to alert any nearby police units of his location so they can easily find him and the apprehended perps Bugg may have caught. 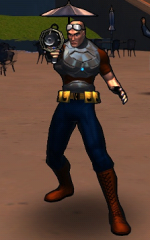 While Bugg did eventually learn how to cast his Bugg-Flare with his already existing fire powers, he still carries the firearm on him simply because its faster and quicker than doing it by hand. Camcorder: When out of costume, James Tyler carries a camcorder for any sorts of investigations that requires him to be "heroic" without the use of a insect-themed brown and tan costume. 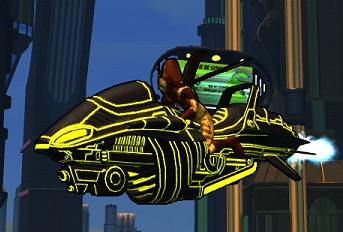 Holo-Hex "Honeycomb" Shield: Bugg recently acquired an energy shield from a crate of VIPER weaponry in Westside. The shield is labeled and branded as "Holo-Hex" Energy Shield, which Bugg often calls the "Honeycomb" shield, due to it being composed of 12 or more holographic hexagons. Insect Armor: Bugg's Insect Armor was a gift from Franklin Carter after a battle with The Bull left his costume in shreds (again). Franklin provided Bugg a Flexium body-armored suit that would make him more resilient to small caliber bullets, lasers, and most kinds of physical damage as well as providing the armor a holographic wing pack for whenever Bugg can't use or loses his organic ones. The armor also, surprisingly, offers the same levels of durability as Bugg's Symbiotic Exoskeleton back when he still had it. Electronic Audio/Visual Bugs: Bugg uses small electronic Audio Bugs of his own design that allow him to track objects or individuals. Basically these are pulled from his belt and flung towards any given location (wall, person, etc.) and then with the help of a built-in radio transmitter Bugg can see/and or listen in on conversations if the use of his super-hearing doesn't help. The Audio Bugs also have built in cameras that connect to a HUD built into Bugg's cowl and mask lenses so he can see whatever his subject sees. The Bugs also can be traced via Bugg's Bugg-Sense but if the subject goes too far out of range Bugg will lose the signal, lastly it is possible to remotely activate the microphone of cellular phones, even when a call is not being made, to listen to conversations in the vicinity of the phone. These little doo-dads are gonna make me the master of all things espionage! On a Tuesday night January 15th 2014, Bugg receives a call from PRIMUS that now is his time to prove himself as a superhero and is given permission to go to Monster Island. Monster Island is the "savage land" of man-animal hybrids that roam the plains of special island thats located not far from Asia, their creator is no other than Dr. Moreau, a mad-man that infuses human DNA into animal test subjects and thus causes the creation of many monstrosities that need to be contained, the alien race known as the Qularr have also been camping out north of the island on an isolated beach where they work on their flea-shaped ships and start working on numerous experiments and devices. Bugg is given a special PRIMUS-issue "Grav-Bike" that he can use for quick transportation which is faster than his "bug wings". The bike is outfitted with a cloaking device, missiles, and force fields. With this bike Bugg can always be on the prowl and vigilante ready to get to a crime in a speed of light. Bugg on his new "Sky Buggy"
Wheelman is so flipping awesome! He's the one who recruited me into the new Eternals line-up and during my interview and one crime patrol with him I learned that hes a real fly guy with a love for hot dogs. Kurt Storm is a pretty okay guy when hes not constantly on your case about not taking down a supervillain without maximum property damage and blah, blah, blah. I know hes here to help me be a better hero when I grow older but come on, I'm still young, I may have power but not enough to take down some supervillains without destroying half the city. Camre Jones was once a fellow classmate of James Tyler and was also the leader of Westside High's Cheerleading Squad. James developed an "awkward" crush on the girl before he even acquired his powers, he commonly went to every cheerleader recital just so he can sit on the bleachers and draw little sketches of Camre in his notepad. James and Camre eventually began dating after a prank devised by Camre's friend caused her to actually fall in love with James. I found Critter in an ARGENT laboratory in Millennium City after my Bugg-Sense went crazy and let me to her after a future version of myself and Halloween went back to their time. 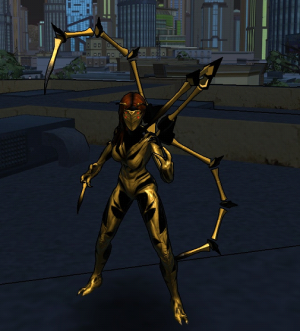 Her real name is Celina Watterson and she happens to have been their during the Qularr invasion months back and she didn't have it as lucky as me when I was just stung by a Firebug, she was kidnapped and experimented on by the Qularr until she finally used her abilities to escape and then get captured by ARGENT. I soon freed her and with the help of UNTIL and Kurt Storm they got her registered at Westside High where I would be her "guardian" and "mentor" teaching her how to use her abilities for the better of mankind. Burt O'Conner was a brilliant scientist and college student until his body was horribly altered from a genetic experiment using DNA from the aquatic race known as, The Bleak Ones after trying to cure himself of cancer. 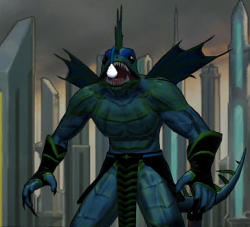 The result was Burt meta-morphing into a humanoid-Anglerfish with large amounts of superhuman strength, durability, claws, and a super regenerative healing factor. He is rumored to live amongst the other Bleak Ones in the underwater city of Lemuria. Bloodleech is a creature of unknown origin he is often tied to magic-related events. 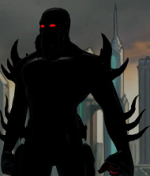 He is background is unknown but all that is known is he is capable of draining heroes and villains of their powers and abilities WITHOUT gaining their weaknesses as well. He met Bugg during his escape from Westside Penitentiary. The only well known information on Bloodleech is that he was once a worker at VIPER who fell into a tank of genetically-altered leeches and he slipped on some nearby water and fell into the tank where the leeches bit him and drank his blood to the point that his DNA soon adapted to the strange chemical enzymes mutated his body entirely by having his Metagene activated and turn him into a humanoid monstrosity known as, The Bloodleech and has wrecked havoc ever since he even made Bugg retire from superheroics for short time due to him draining Bugg of all his powers at one point. Michael Turner was a scientist who worked with the military in creating a special invisibility serum which would render its user the ability to turn invisible and no be seen by the naked eye, due to it being a secret project only the government knew about, Michael's resources were very limited and tested the serum on himself and it turned out to be a complete success until Michael found that he couldn't turn visible again and was left with special powers which dealt around sound allowing him to manipulate sound waves and even bend them to turn other things invisible and create force-fields, Michael then turned to a life of crime due to how he could pull off anything and get away with it because he could no longer be seen. He was shortly apprehended by Bugg (who used his enhanced hearing to catch and defeat Michael) and turned over to the local police who then sent him to Stronghold where he was given a ridiculous costume so security guards could see him, he eventually broke out with the other inmates and is rumored to be back in Millennium City watching and lurking for the one kid who sent him to the hell that is Stronghold. It has been said that there is an ancient DNA in humans that was placed eons ago and when activated can transform said humans into slugs. 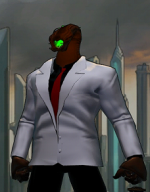 Unfortunately for Dr. Henry Thomas he was kidnapped by the Elder Worms and had that "hidden DNA" activated and transformed into a slug with strong levels of psionics he then set out to use his new powers on the new hero, Bugg. John Dothan was a billionaire who had it all, he owed his own corporation named, DothCorp and he had a loving wife and son. There was always one thing John hid from his family and employees and that was he suffered from Bipolar Disorder. John showed that instead of shifting from happy to sad or from crying to angry, John in fact would shift mainly between insane and crazy to serious and intimidating. John stressed himself out day and night creating a "Performance-Enhancer" super serum that would make an ordinary man a super-soldier with peak human conditioning and abilities he later used the well known VIPER drug, Draysha which enhanced his peak conditioning and gave him superhuman strength, speed, durability, and a regenerative healing factor. 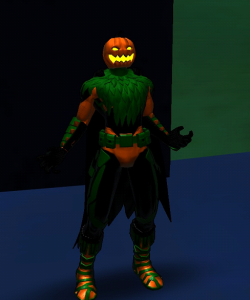 John later found out the Draysha and the Performance-Enhancer caused his Bipolar Disorder to go "haywire" and he later became completely insane "Mad as a Jack-O-Lantern" John once stated and thus decided to use his new power to become the villain known as, Halloween. John had a "Bag of Tricks" that mainly contained Toilet Paper Grenades, or TP Bombs for short. These bombs would have the guise of toilet paper but the "tissue flap" would be lit and cause an explosion of fireworks or confetti. 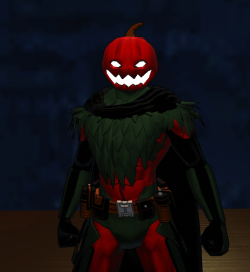 Halloween debuted sometime near the end of the Blood Moon event in 2013 when Bugg soon found out Halloween's true identity, he tried to save him only to get probably the "sanest" thing John Dothan ever said and that was: "You Can't Save a Man Thats already Dead". That was John's last words before jumping off the roof of DothCorp, but rumors are speculating that Halloween is still alive and hiding out in Vibora Bay. During a time when Halloween was believed to be dead, a pretender rose and took his spot. Calling himself Red Harvest, this man wore a red variant of the original Halloween suit and wielded the same level of power and same variety of equipment as the original, thus this made the public believe that either Red Harvest works closely with Halloween and he is to take Halloween's spot if he were to die or be severely injured or there was a whole army of soldiers like Halloween out there watching and waiting. Bugg was immediately thrown on the case as anything that deal with Halloween or if his name even pops up anywhere Bugg has to be there since Halloween is his arch-nemesis. Bugg eventually got a lead on Red Harvest and found out that his real name was Robert Harley and he used to work for John Dothan at DothCorp and he was the original guinea pig used to test the Performance-Enhancer drug that gave Halloween his powers. After believing Robert died after being subjected to the Performance-Enhancer, John had his body dumped in a river only for Robert to rise weeks later and steal the first prototype of the Halloween costume and spend the next few years training and learning the full extent of his abilities. Now he has finally risen and has taken the spot as the new Halloween. Of course all good things come to an end as Halloween did eventually make his return and Robert still had to operate as Red Harvest. Now Bugg is left with two Halloweens he has to deal with. The Original and Red Harvest. Isaiah Masters was once a heater repair man for Dynamic Labs, he was looked at as a nobody. Isaiah idolized Bugg mainly for it being amazing for a young man risking his life to save others with his amazing bug powers he also idolized Bugg because he saved Isaiah from almost being hit by a tanker truck who had his brake lines cut by an unknown person. One day at Dynamic Labs Isaiah was told to stay after to repair a broken heater unit in the ceiling, what Isaiah didn't know was that unit was located over top a tank of liquid nitrogen. Liquid nitrogen boils at −196 °C (77 K; −321 °F) and is a cryogenic fluid that can cause rapid freezing on contact with living tissue. Isaiah's foot happen to slip after fixing the heating unit and fell into the liquid nitrogen tank, Isaiah felt his entire body freeze over and within seconds the tank exploded freeing Isaiah from his frozen chambers. 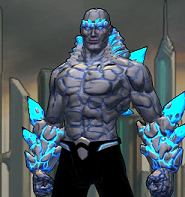 Isaiah awoken with cryogenic powers or ice powers for short, he went on a rampage downtown where he was subdued by Bugg and fellow friends it was after this Isaiah became known as, Coldfront and now despised Bugg for betraying him as a role model and "fan" friend. Gregg Dietrich was a troubled child while growing up. He was teased for his insectophobia, the fear of bugs and insect, by the neighborhood kids and he was often chased and pinned down while most of the bullies he would encounter would place all sorts of creepy-crawlys they could find on Gregg. Several years later Gregg would become an exterminator killing the creatures he so desperately despised. When James Tyler would be stung by the Firebug that gave him his insect powers and become Bugg, Gregg would start having nightmares of giant humanoid insect coming to him in his sleep and eating him or laying eggs in his body and have the baby bugs burst of his stomach and crawl out of his mouth. Gregg would always wake up in a cold sweat because of these dreams and that was when Gregg decided that the only way to face his fear was to exterminate it. Creating a his own unique deadly insecticide and donning a costume, Gregg would become The Exterminator and would kill this giant bug. Bugg would of course stop Gregg with no probably but this was also when Bugg found out that his insect side was "allergic" to insecticides and he could be weakened by them and Gregg knew this as well, because of this alone The Exterminator became a high-threat to Bugg and his other insect-powered allies. Edwin Strange was once a brilliant special effects artist and skilled magician, one flaw Edwin would always face was bad luck. He lost his job as a special effects artist after they were described as "too cheesy" and was causing many film franchises to not make as much money, he even used to wow the folks at many casinos with his magical illusions but was soon kicked out due to belief that he was stilling money from the casino manager(s). Out of two jobs, Edwin lost everything and found himself living in the street until he found a magic shop disguised as an old rundown library and was given a magical amulet which would grant him powers that would allow him to create his own horrifying illusions and nightmares as well as high levels of telekinesis. He would soon use his new power to rob banks and attempt to kidnap the mayor before finally being stopped by none other than Bugg. The quirky hero would find it hard to battle against someone who could create things that weren't really there but still managed to beat him and have him taken into PRIMUS custody until his recent escape in June 2014. The Buzzard stays true to his name, being that he is an aging man around the age of 50+ this man was once an ordinary citizen named, Anderson Seigel. He is responsible for creating a street drug called, Buzz, this drug was actually a super-soldier serum that was never used or patented after finding out that it granted limited levels of superhuman abilities. After the military decided to take away the formula Anderson used to create Buzz, he finally decided to take the time and finish working on a cybernetic exoskeleton that would provide the ability to fly at supersonic speeds touching himself up with the last remaining sample of Buzz, Anderson adopted the name The Buzzard and set out to kill the military scientist ordered to destroy his leftover super-soldier serum only to have his plans thwarted by none other then the insect himself, Bugg. Jason Crause was a fellow scientist working for ARGENT examining the latent gene in Qularr DNA which led to the creation of Bugg. Jason eventually created the Insect Q1-N1 serum, this serum was created by combining Qularr DNA with the drug created by VIPER called, Draysha, a steroid of some sort that morphs the physical attributes of the human body. Jason decided to use the new serum on himself which led to disastrous consequences and caused Jason to transform into a monstrous creature named, Insectiod, he has since become a thorn in Bugg's side being that he is now morphed into a Qularr drone. John O'Hirn was once a member of the New Purple Gang and worked as one of the many "Hired Muscle" men within the gang, when John seeked a better line of power and brutality he turned to VIPER who made a deal that if they made John more "powerful" he would work for them in return, soon after agreeing John was exposed to various chemicals and drugs that would make his skin density more thick and unbreakable and strapping him into a Questionite bull-themed armored suit. John was soon nicknamed, Bull and became the Muscle Man of VIPER until leaving to pursue better opportunities like catching and killing superheroes, Bull later crossed paths with Bugg after he foiled his attempts of robbing Millennium City National Bank. 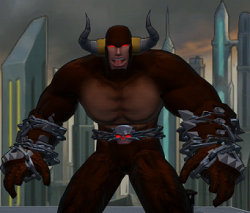 Bull has since becoming one of the most powerful nemeses within Bugg's rogues gallery. Sherman Watts was a low-life crook who found himself always robbing mom-and-pop stores and sometimes banks and he would always get caught and sent to prison by the brat known as, Bugg. One day Watts was sent but was quickly bailed out by an anonymous person who supplied Watts with the proper tech needed to squash the insect and that was a brown briefcase with a insulated black-and-white leather suit that had a sound-wave insignia on it as well as a mouth piece that would allow Sherman to scream and yell with a sonic shriek and finally a note reading "You are now Onomatopoeia. With this equipment you shall serve as a worthy threat against "Bugg" now go show me what you can do". Sherman Watts then became Onomatopoeia, a villain with a sonic scream that is capable of overpowering Bugg with much ease and little action. Tar-Trapper (Alex Warner): Alex Warner was a small-time employee working for VIPER in their R&D department. When Bugg infiltrated a VIPER base to rescue a kidnapped girl named, Jessica Langsdon, Alex developed a special "tar gun" to trap the bug. He eventually evolved to become a small-time crook named, Tar-Trapper using his newly created Tar Gun to trap those in a boiling tar-like substance that proves inescapable allowing him to (sometimes) pull off the perfect heist. Equipment: Tar Gun - The improved Mark II version of this weapon attempts to coat targets in a boiling, tar - like substance that substantially reduces all forms of movement (even teleportation; the extra weight excitable molecules of the goop prevents you from popping out!) and reduces your ability to dodge and avoid attacks. Blocking is no protection against this goop! What Does a Frog Do When Its Scared? It JUMPS! Like Me! WEEEE! Johnny Jumper: Johnny Carson is nothing more then a wannabe super-villain thats out to make a name for himself. 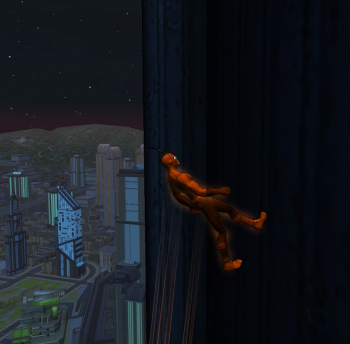 Using a new gravity manipulating suit, Johnny becomes Johnny Jumper, often named in the local papers as "Leapfrog". 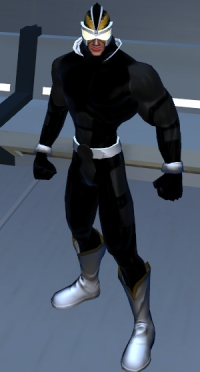 Captain Kruel: While his real name is unknown, Captain Kruel is a dim-witted super-villain who possesses high levels of invulnerability and superhuman strength. Recently in 2014, The Insidious 7 rehashed themselves with a new line-up of villains, this time with ones that weren't amateurs and spun directly out of Bugg's rogue gallery with Swarm Queen still acting as the team leader. Bugg needs your help. Only by leaving a comment may free him from the Gadroon's gravitonic force fields. Well, He's defiantly BUGG-tastic! Badumtiss!, No, But really, I haven't met the guy but he looks cool, Maybe we should all form a group for Insect-based heroes! - Icehopper. Often questioned for whats the "real" reason Bugg became a superhero, Bugg never knew the exact answer himself but only being a hero for two years has left James Tyler (Bugg) with the real answer. All throughout James' life he was bullied, alone, sad, depressed, and worst of all not having anyone there in his life, of course there was his grandmother but he spent too much time trying to take care of her instead of the other way around. As Bugg, James gets a chance to be a role model to others as well serve the perfect teenage hero for other teens to look up to and when James thinks really hard on it, he believes he also became Bugg to be there for others since he never really had anyone there for him and he does this by using his power to help and save citizens of Millennium City. Bugg's actions throughout Millennium City are regularly printed and reported on the news or in the local Millennium City Press, maybe you'll see/or find an article about him there. Bugg is often slandered as a cocky, power-abusing menace by a guy named, Cyrus Samson, owner of a newspaper known as the Millennium Tattler. 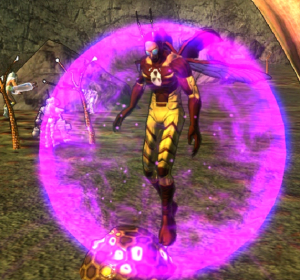 A rumor about Bugg joining the new incarnation of Eternals, Inc. has been spreading all through the city, maybe you have also heard of these rumors. Bugg wearing his special made "Insect Armor" created by Franklin Carter using his Flexium element. A good actor who could portray or voice Bugg would probably be Logan Lerman from the Percy Jackson film franchise. Bugg's favorite is the 1986 remake of the movie, "The Fly". This has been his favorite movie both before and after getting his powers although he does have nightmares of him transforming into a insectoid-creature. The name "Bugg" was actually a mistype when it was printed in the paper, so this inspired Jimmy to adopt this as his hero name. The Qularr are an alien race with the appearance of a person-sized bug-like creatures; much like a combination between an insect and a lobster, but being that Jimmy was bitten by a firebug and not an actual Qularr he gained only bug-related powers. Jimmy possesses pretty accurate hearing beings that the Qularr lack perfect eyesight but have excellent hearing. Bugg has somehow tapped into police radios and modified it so that not only they receive reports of superhuman activities but the Bugbots as well. Bugg CANNOT be defeated with ice or cryogenics of any kind due his physiology not being completely fire-based. Favorite song is "I Won't Back Down" by Tom Petty. First hearing it on the DVD, Barnyard, The Original Party Animals this song became stuck in James' head and later his heart after it soon stuck as the best motivation song to him. Bugg is immune to psionics and any other mental based attacks due to the antennae on his mask being outfitted with psychic blockers leaving mind-readers with a painful headache. Absolutely HATES "Punch Buggy" Jokes, If you catch my drift. Sometimes known for his corny rhythm, "My name is Bugg, I live under a rug with my best friend Doug". Despite his real name being "James Tyler". Most of James' friends call him "Jimmy James" since he doesn't have a specific preference to which name he rather be called by. Is considered the first successful cross between human and alien. Believes he can never get a girlfriend since girls fear bugs and "creepy-crawly's"
James Tyler was once a vegetarian before switching back to regular delicious foods like ham and cheeseburgers. Is familiar with poems by Edgar Allen Poe, especially his famous one on "Quoth The Raven". This page was last modified on 8 August 2017, at 04:22. This page has been accessed 496,804 times.